The old town of Albufeira has a long and riveting history behind, a part of which constitutes this 18th-century church, every nuance in its architecture speaking volumes for the seasons it has weathered. The Sant’Ana Church is a quite a feat of architecture, with its intricately-patterned ceiling and pinnacles contributing to the sense of an enduring faith. There are also hints of the Moorish influence on the Sant’Ana Church in the white-washed cupola, one of the details of this ancient church that has drawn much admiration over the years. 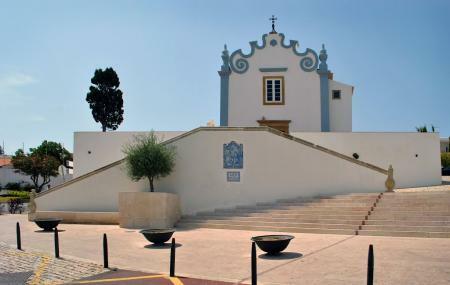 Located in the Largo Jacinto d’Ayet, in the old town of Albufeira, the Sant’Ana Church was renovated in 2008when it was closed for eight months, but its revered place as an important cultural landmark never faltered once. Sant’Ana Church has carved out its own niche in the historical city of Albufeira and the need for its preservation is a unanimous, unspoken understanding. The preservation process carried out included the recovery of the entire gilded woodcarving on the main altarpiece (which is now stunning), the two side altarpieces, the pulpit, several figures, and the entire roof was replaced. The church is available for visiting, except during service, and makes for an insightful trip around the old town. Head on over and light an electric candle! There aren’t too many restaurants in the immediate vicinity so eat before or after the visit. The church has erratic timings and is generally open in the mornings, but it’s a good idea to check locally once before making the trip. Love this? Explore the entire list of places to visit in Albufeira before you plan your trip. Fancy a good night's sleep after a tiring day? Check out where to stay in Albufeira and book an accommodation of your choice. How popular is Sant'ana Church? People normally club together Clock Tower and Praia Dos Pescadores while planning their visit to Sant'ana Church.